I mentioned earlier that I am a fan of Roman dial watches and this here’s a nice one from Seiko after the SARB043. This model was released in January 2011 and is powered by the 4R35 movement that comes with hack and handwind features. Below are some pictures and quick observations. Shown below is a close up shot of the dial. The hands are blue and the center of the dial is textured. The Roman markers are black and the date window with black frame is located at the 3 o’clock position. If you look carefully, you will notice that there is a silver ring separating the minute chapter ring and the dial. The watch is installed with a flat Sapphire crystal. Below are a couple of side profile shots. From these pictures, you can see that the lugs are drilled through and appear bigger than usual. However, there are no screws on them. The spring bars are actually installed by the standard way and you can push them out via the drilled holes. Here’s a caseback shot. Like the SKZ297J featured in my previous post, the SARY005 also comes with solid caseback. Watch comes with a nicely designed bracelet with solid end links. I find that most brands use IIII for four instead of IV. This is probably to make the dial more balanced. You’re right. The majority of dials with roman numbers has a IIII instead of a IV, though. This has been discussed many times on watch fora. General agreement is, like Thomas said, that creating a similarly dark counterpart to the optically heavy VIII makes the dial design more balanced. That’s what I heard too. Thanks for chiming in, Pezie. Hi Larry. This practice is actually quite common with watch manufacturers. Rarely do I see a Roman numeraled dial that has a IV instead of a IIII. This is probably due to the fact that it would look odd if the orientation of the IV is downwards or towards the center. That’s a really handsome dress watch! Much better looking, for me at least than the Seiko Superior – SKZ297J. The blue hands and roman markers on the dial does it for me! And it has the anti-magnetism symbol on the case back too! Cool! There is a rose gold version and its model number is SARY008. The rose gold version is fantastic, Thomas. Reminds me so much of a Cartier…..but, should it? The design cues are very similar, including the crown. Thanks for posting the picture of the rose gold. Hope it arrives here soon! This model will be available in the international market under the Presage line. A few more variants with the same case will be added. New Seiko 5’s will be using the 4R movement as well. Hello from down under (Australia)! Fantastic watch that SARY005. Have you purchased it? I am about too after seeing your pictures. Too bad there are no reasonably priced JDM in Melbourne. I really would like to try it out before purchase. It is good to hear updated movements for the Seiko 5 line. Nothing against the 7S but I prefer to be able to handwind my watches. 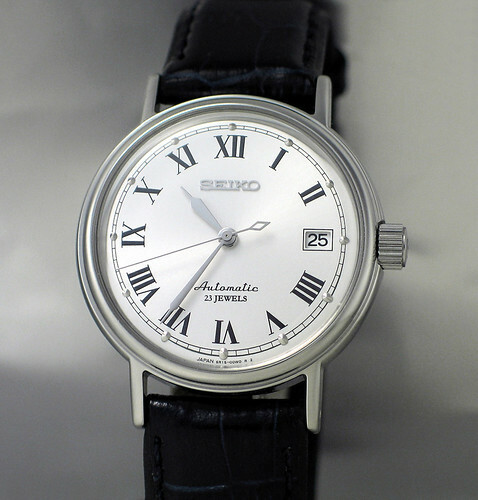 Btw, they will release a few 130th Anniversary Seiko 5 models that are based on the 4R movement. Haha great minds think alike. Those are the EXACT reasons I am purchasing this watch.I missed the SVCS013 Blue Spark (sigh I still want one though) I am not going to miss this one. one. 130th Anniversary Seiko 5. If any of them is a dive watch with white face and blue hands I am sold! Enjoy your watch in good health! I saw three 130th Anniversary models and all three are Seiko 5 Sports 100 models. Hope they make a 200m diver for the event. lovely design, looks solid and inspires reliability, and the bracelet is also a feat. however, since i’m about to get a seiko 5, i would’ve like this one to have day indicator and see-thru caseback. any ideea when the new seiko 5 makes it onto the market, and maybe a hint about the price? There are a lot of Seiko 5’s with day/date in the market. Look around and you will find some. Well I have done it. Got the watch last friday (thats right after the earthquake) from Japan (Chino) and it arrived yesterday (Sunday would you believe it). I had it on the whole day today and so far the only issue I had with it is the crown its hard to handwind it almost no grip. Other than that loved it. Watch and bracelet felt lighter than my Oris with a similar bracelet only with butterfly clasp instead. Congrats on the purchase, Kenny. I agree with your comments on the crown. The grip is not as good as I would like it to be and it becomes difficult to wind after several rounds when the spring gets tighter. I love this watch, but when I tried to look for it, I found its model no. to be SRP119J1, it’s the same one, right? Really love the classic design, especially the pattern of the inner circle, which is the same as my Orient CFDOE003W. SRP119J1 is its model number in the international market (outside Japan). I believe it’s the same watch. I have had this jewel delivered today and after having adjusted the band and worn it on my wrist in clear light I discovered I have totally missed something. The arabic digits are blue as well!! I never noticed that before. After second look, it can actually be seen on the second picture in this post. Well, I have to go…a bit of polishing now. I thought they are black. Will take a look at the watch again. Thanks. Nice watch, I really like the SSA017 too! Does you know why most watch companies with roman dials use the incorrect roman numeral for the number four? Any elementary school child can tell you that four is IV. I guess they want to balance up the left and right halves of the dial. I`ve just purchased a SSA015j it is the same crown, bracelet and case, a pity i got late for SSA017j but it is the same watch with 4r38, black dial only leather strap. i think i will put a leather with deployant, it is my first seiko and is awesome, cant take out my eyes from the open heart, and the sweeping second hand is hipnotizing. thanks for writing for all of us. Congrats on the SSA017J and welcome to the world of Seiko watches. I’m sure the watch will serve you well for many years to come. Any comments on how this would look on a brown/black leather strap? The blue hands don’t go well with brown strap. Black would be a better choice.